I'm a Harry Connolly partisan. Basically he could tell me he's doing a re-write of the phone book and I'd sign up for his Kickstarter campaign. So maybe there's something wrong with his writing that I just can't see. No, that isn't it. Everything he produces is perfect. His previous series was the 20 Palaces series and it was just freaking awesome. Indeed, the first book of the series starts off in such a way that I think it should be used as a model for how novels should start. 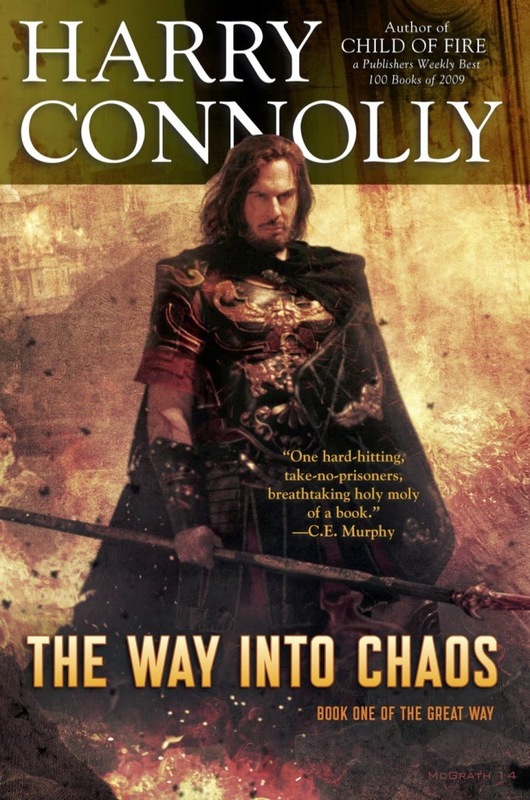 Comparatively speaking, his new novel The Way Into Chaos starts out slowly. I think everything doesn't explode until about page 3. I love the imperfection of the characters. They're just exactly wrong. Indeed many of the characters are written such that you instantly dislike them but then they grow, and grow on you too. The magic "technology" in the book is pretty fascinating. And the story is structured such that the exact way the magic works is revealed in sort of a logical, rather than a pedantic, way. I am not proud of myself for thinking this, but I sure do like the feel of this book. How nice books feel is one of the things which has kept me away from an e-reader all this time. This paperback has a particularly soft and silky feel which I really really like. The Way Into Chaos, of course, ends on a cliffhanger. * Somehow, stupidly, I did not back the project such that I would get the entire trilogy, just the first book. So yeah, I could read the other parts if/when I get a Kindle Voyage, but I won't be able to pet the covers on the way to the studio and back.